Emory senior Elizabeth Jordan "Jordie" Davies is being honored by Campus Life for exemplifying the division's key concept for December: polyculturalism. Photo by Matt Cone. 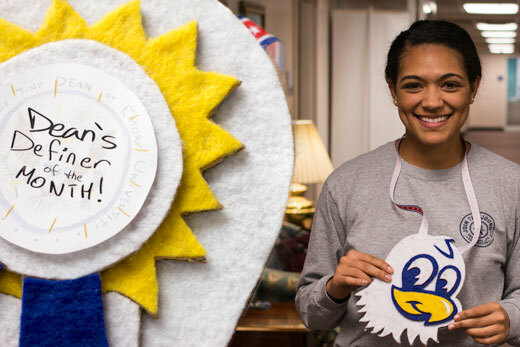 As a biracial individual raised in a predominantly black and white community, senior Elizabeth Jordan "Jordie" Davies found that her Emory experience helped her embrace her own multiple identities, celebrate the identities of others, and assist fellow students doing the same. The Division of Campus Life honors Davies this month as a student who exemplifies the division's key concept for December: polyculturalism. An important aspect of Campus Life's vision of the university community, polyculturalism is defined as "recognition and appreciation of the multiplicity and intersectionality of our identities; the reframing of multiculturalism to view culture as dynamic and thriving." Encompassing multiculturalism but extending deeper, polyculturalism acknowledges and appreciates the various identities that comprise each individual — identities like race, ethnicity, gender, sexual orientation, religious faith, family relationships, occupation, socioeconomic status, political ideology and many more. Davies was born and raised in the South Georgia city of Eastman, home to a population of 13,000. "My hometown is relatively homogenous," she said. "Most people are either white or black — and almost everyone is southern and Christian." As the daughter of black and white parents, Davies — like many biracial children — struggled to reconcile her personal identity with her racial identity. To further complicate matters, she was a more studious child than most, another identity with which to grapple. Joining Emory's multicultural community helped Davies gain a better handle on identity. She accepted the ambiguity of race in her life and the larger society, along with what she describes as her "nerdiness." This "journey of self" was aided by her Emory experience and the ways the university fosters polyculturalism by connecting learning in the classroom with learning in the community. "Through my research on identity and by getting involved on campus and interacting with students of different backgrounds, I've learned to be comfortable with my own identities and to respect and embrace those of others," Davies says. "That's an important part of the Emory experience." Nonetheless, she acknowledges, she has witnessed bias — "micro and macro aggressions" — directed at individual students and groups. "When you see anyone targeted that way, it makes you hold on more tightly to your own identity," Davies says. "But, more important, at Emory, I have found a community that supports me." She praises student-run organizations like the Emory Black Student Alliance and its counterparts for standing firmly against bias. Viewing community engagement as vital to her Emory experience, Davies has taken advantage of many opportunities for learning beyond the classroom. As a rising sophomore, she served as a resident advisor with Residence Life & Housing. She is now is a senior RA, managing a staff of resident advisors who work with more than 130 students in Turman Hall. "As an RA, you have students from all over the world with different beliefs and different needs," Davies says. "Students are living together and learning to celebrate each other's identities, which helps them to form their own. RAs are an important element in supporting that formation." This past school year, Davies was one of nine undergraduate students awarded a Community Building and Social Change Fellowship by Emory's Center for Community Partnerships. CBSC fellows engage as partners with community leaders and organizations, as well as local government, to address pressing social issues in greater Atlanta neighborhoods. Davies also served last academic year as a student researcher at the Ralph Bunche Summer Institute, one of 12 students nationwide selected for five weeks of intensive coursework in race and politics at Duke University. During spring 2013, as one of four Emory students awarded Mellon Mays Undergraduate Fellowships by the Mellon Foundation, she researched the relationship between the online and offline political participation of African American youth. What advice does Davies offer to other students on embracing polyculturalism and learning to celebrate multiple identities? "Being empathetic is the first step — trying to understand. Learn to listen twice as much as you talk, and even if it doesn't work at first, the person will appreciate it," she says. "Embracing polyculturalism also means self-exploration. So, learn as much as you can about the world to learn more about yourself."